This is an unedited publication. In November 2016, I was honored to present the reports on the thirty-second and thirty-third sessions of ISAR to UNCTAD’s Investment, Enterprise and Development Commission. These reports highlighted the significant achievements of ISAR in these past years. In particular, the launching of an initiative on selecting a limited number of core indicators for sustainability reporting at UNCTAD 14, which was further explored at the thirty-third session of ISAR, provides evidence of UNCTAD’s leading voice in the area of corporate reporting for sustainable development. 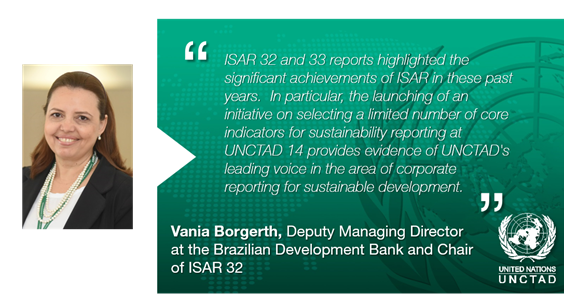 As the United Nations focal point for issues of corporate reporting, ISAR has since 1982 played a key role in helping countries achieve a high-quality reporting environment, and facilitating the sharing of best practices in accounting, auditing, corporate governance, and much more. In light of the Sustainable Development Goals, both financial and non-financial corporate reporting are becoming increasingly important for all stakeholders. This newsletter provides information on ISAR’s most recent events and achievements, and includes relevant news briefs from the reporting community. It is my pleasure to open this edition and I would like to use this opportunity to invite the entire ISAR global network to engage further in enhancing the role of accounting and reporting in attaining the Sustainable Development Goals. The role of disclosure in risk assessment and enhancing the usefulness of corporate reporting in decision-making. On 31 October 2017, ISAR will also host a technical workshop on corporate reporting. Further information about the session and the workshop will be shared with the ISAR network in the coming months. The Fourteenth Quadrennial Ministerial conference of UNCTAD (UNCTAD 14) took place in Nairobi, Kenya, from 17 to 22 July 2016. UNCTAD 14 brought together Heads of State and Government, ministers and other prominent players from the business world, civil society and academia to tackle global trade and economic development issues. In parallel to the UNCTAD 14 Conference, the World Investment Forum 2016 also took place in Nairobi, serving as a global forum for inclusive dialogue and policy formulation on investment-development needs at the highest level. The outcome document of UNCTAD 14, the Maafikiano, states that UNCTAD should advance its work on international standards of accounting and reporting, and promote best practices in corporate transparency and accounting, including through the use of the Accounting Development Tool, in coordination with international efforts in the field of sustainability accounting as appropriate. As part of UNCTAD 14 and the World Investment Forum, UNCTAD hosted the High-Level Policy Dialogue on Sustainability Reporting on 21 July 2016. The event facilitated the sharing of views on how to enhance the role of corporate reporting in attaining the Sustainable Development Goals. High-level speakers, including from the National Treasury and Capital Markets Authority of Kenya, the International Integrated Reporting Council, the Association of Chartered Certified Accountants, the International Federation of Accountants, the International Organization for Standardization and the Climate Disclosure Standards Board, discussed the need for concerted efforts in harnessing the contribution of the private sector to sustainable development. During the High-Level Policy Dialogue, ISAR launched its initiative on selecting a limited number of core indicators for SDG reporting by companies, in order to enhance the role of corporate reporting as a tool to assess the private sector’s contribution to the attainment of the SDGs. For further information about the High-Level Policy Dialogue, please click here for the press release. Enhancing the role of reporting in attaining the Sustainable Development Goals: Integration of the environmental, social and governance information into companies’ reporting. The session also included presentations by countries that implemented the Accounting Development Tool during the intersessional period, as well as updates from other international and regional organizations in the area of corporate reporting. UNCTAD had the opportunity to provide an overview of its new project on Capacity-building for financial inclusion and access of small and medium-sized enterprises to finance. All presentations are available here. More than 200 representatives from over 70 countries and leading international or regional organizations took part in the meeting. These included representatives from the International Accounting Standards Board, the International Federation of Accountants, the Financial Stability Board, the Public Interest Oversight Board, the Association of Chartered Certified Accountants, the Sustainability Accounting Standards Board, the International Integrated Reporting Council, the Climate Disclosure Standards Board, the World Bank, and the Global Reporting Initiative, as well as national policy makers, professional bodies, companies, academia and other stakeholders. As part of the event’s key conclusions, ISAR provided final comments about UNCTAD’s discussion paper on good practices in the area of monitoring of compliance and enforcement for high-quality corporate reporting. UNCTAD is currently in the process of incorporating these suggestions and finalizing the document, which is expected to be published as a Guidance in early 2017. Furthermore, ISAR delegates called on UNCTAD to advance its work on the selection of a limited number of core Sustainable Development Goal reporting indicators to facilitate the harmonization of sustainability reporting, with a view to developing a guiding document. UNCTAD will continue to facilitate dialogue between major corporate reporting stakeholders in order to enhance the role of corporate reporting in attaining the Sustainable Development Goals. UNCTAD also signed a Memorandum of Understanding with the International Federation of Accountants, in order to collaborate on how to harness the contribution of the accountancy profession to the agenda of sustainable development and the SDGs. A technical workshop on accounting and reporting was held at the Palais des Nations in Geneva on Monday 3 October 2016. The workshop focused on the practical implementation of financial accounting and reporting standards on revenue recognition and leases. The goal of the workshop was to bring together representatives from standard-setting bodies, especially the International Accounting Standards Board, and representatives of developing countries and countries with economies in transition, in order to discuss practical implementation of the two newly issued standards. As part of a Development Account capacity-building initiative, ISAR held a high-level regional workshop in Medellin on financial inclusion, focusing on accounting and insurance for MSMEs. It was attended by key policy regulators and experts in the area of accounting and insurance for SMEs, in Latin America. The workshop sought to facilitate the sharing of best practices and to enable the development of action-oriented strategies in the areas of accounting and insurance for MSMEs, with a view to enhancing their access to finance and insurance services. UNCTAD delivered the workshop with the support of partner EAFIT University. The meeting also discussed the relevance of implementing the Accounting Development Tool (ADT) in order to assess a country’s corporate reporting framework for SMEs, in light of international best practices. Among its conclusions, the workshop highlighted the importance of facilitating collaboration of different stakeholders and policy makers in the area of access to finance, implementing capacity-building tools that draw on international best practices and benchmarks (including the ADT), and supporting guidance adapted to small companies’ needs and capabilities. In this regard, the relevance of UNCTAD’s guidance for microenterprises (SMEGA 3) was discussed as a practical tool to facilitate the financial inclusion of micro-entrepreneurs. The full programme of the meeting is available here (Spanish only). The Inter-agency Expert Group on SDG Indicators (IAEG-SDG) has designated UNCTAD and UNEP as co-custodian agencies for SDG indicator 12.6.1, Number of companies publishing, sustainability reports. In order to support the IAEG-SDG in the process of defining this indicator UNCTAD and UNEP are working together in cooperation with other key stakeholders and institutions on developing a metadata guiding note. Further information about the IAEG-SDG can be found here. ISAR is keen to maintain and extend its outreach to government officials, professional bodies, international organizations, private sector and other experts involved in the area of accounting and reporting. To this end, UNCTAD relies on you to keep us abreast of any updates to your contact information. If you are not already part of the ISAR network and would like to join for updates on ISAR’s meetings, events and activities please complete this on-line ISAR Network form. Further information on how to become a formal member of ISAR can be found here. After holding a public consultation on non-financial reporting guidelines in early 2016, the European Commission has issued a summary about respondents’ feedback. Over 300 representatives from companies, business associations, investors, public authorities at the regional and national levels, international organizations and civil society contributed to the public consultation. The summary highlights that respondents attach importance to the materiality of non-financial information, as well as the need for a multi-stakeholder perspective. It was indicated that responders prefer a high level of detail in the guidelines, including references to existing reporting frameworks. A significant concern underscored by respondents is that the new guidelines should cover aspects of corporate board diversity, as well as include examples and best practices for non-financial reporting. On 20 September, the International Financial Reporting Standards (IFRS) Foundation published the 2016 edition of A Guide through IFRS Standards. The report includes official pronouncements issued by the board as of 1 July 2016 Highlights include: the new IFRS 16 Standard on leases, clarifications to IFRS 15 on Revenue from contracts with customers, as well as amendments to IFRS 2 (Classification and measurement of share-based payment), IAS 7 (Disclosure initiative), and IAS 12 (Recognition of deferred tax assets for unrealised losses). Further information on the press release can be accessed by clicking here, and a sample of the full report is available on this link. The International Federation of Accountants (IFAC), through the International Ethics Standards Board for Accountants (IESBA), has launched the 2016 edition of the Code of Ethics for Professional Accountants. The edition includes new sections related to accountants’ responsibilities when they became aware of non-compliance with laws and regulations, with changes effective July 2017. Furthermore, IFAC’s International Accounting Education Standards Board (IAESB) has issued a new guidance on International Education Standard (IES) 1 about entry requirements to professional accounting education programs. The guidance includes principles for setting entry requirements, frequently asked questions, and an illustrative example. Further information can be found in the press release, and the guidance is available here. IFAC has published a new report that seeks to provide A Snapshot of the Accountancy Profession’s Contribution to the United Nations 2030 Agenda for Sustainable Development. The report “highlights the importance of the Goals to business and the profession, and considers how accountancy contributes to eight specific Goals … (and) features existing activities and initiatives within the profession that support the Goals and poses questions for professional accountancy organizations and professional accountants to consider.” The full report is available here. In July 2016, during the ECOSOC High-Level Political Forum in New York, the International Organisation of Supreme Audit Institutions (INTOSAI) co-organized a side event, together with the United Nations and the Permanent Missions of Austria and of the United Arab Emirates, about the contribution of Supreme Audit Institutions to ensuring that no one is left behind in the implementation of the SDGs. The discussion focused, among others, on the importance of performance audits, the role of Supreme Audit Institutions in supporting accountable and transparent organizations, as well as on the fight against illicit fund transfers. Further information about the event can be found here. In October 2016, the International Organization of Securities Commissions (IOSCO) published its Report on Corporate Governance in Emerging Markets. Among others, the report identifies possible approaches to align regulatory frameworks with international frameworks, benchmarking current corporate governance practices in emerging markets against the G20/OECD Principles of Corporate Governance. In the press release, IOSCO underlined the report’s key contributions in the areas of board composition and responsibility, remuneration and incentive structures, and risk management and internal controls. The Global Reporting Initiative (GRI) has launched new sustainability reporting standards that seek to be “the world’s first global standards for sustainability reporting.” The standards are based on the G4 guidelines, with an updated format and modular structure, with a view to making standards straight-forward yet thorough. “With input from business, labor, government, investors, civil society, academia and sustainability practitioners, the Global Sustainability Standards Board (GSSB), a fully independent standard-setting body, developed the GRI Standards in the public interest. This multi-stakeholder process is a critical element of GRI’s commitment to making sustainability considerations integral to every company’s decision-making process.” Further information on the standards is available here. A new publication from the Climate Disclosure Standards Board (CDSB) and CDP, EU Environmental Reporting Handbook, provides guidance about how companies can o report on non-financial information under European Union Directive 2014/95/EU. The handbook seeks to reduce the reporting burden of companies by providing case studies of good practices in corporate reporting, as well as by mapping the requirements of the Directive against the guidelines issued by CSDB and CDP. “The examples are focused solely on environmental matters, but some recommendations may also be useful for reporting other non-financial information.” Click here for the press release, and here for the full publication. On 1 December, the Sustainability Accounting Standards Board (SASB) hosted its 2016 Symposium, with the theme of “Moving the Market.” Stakeholders in the area of sustainability reporting discussed the relevance of sustainability information for capital markets and investment, with attendees including the corporate sector and the investment community. Issues of valuation, risk management, and the enhanced role accounting plays in sustainable business were at the core of the event. Further information, including an agenda, can be found here.